When a player damages Sima Yi, he can take one of their cards for each unit of damage that he took and place it in his hand. After a judgment is flipped, Sima Yi can discard one of his cards. 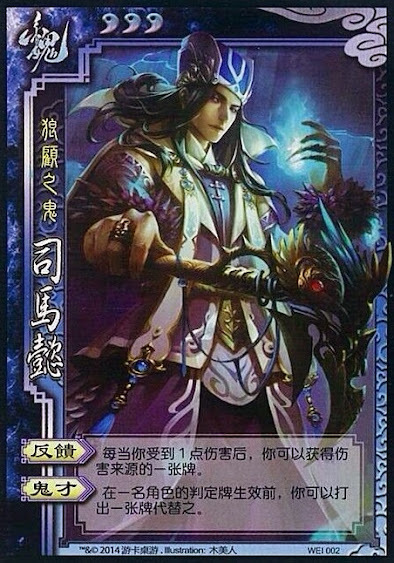 The card that Sima Yi discarded then becomes the new judgment . If Sima Yi is damaged more than one unit at a time, he can use "Feedback" multiple times. When Sima Yi is damaged, he can take either a hand card or an equipped card from the source that hurt him. He cannot take a pending card however. Unlike the original version, Sima Yi can now use equipped cards for "Devil". When multiple judgment tinkerers are in play, the order of the tinkering is determined by the seating arrangement. When a judgement card is flipped, start with the character who is currently taking their turn and move to the right until you reach the first judgement tinkerer. This character can choose to activate their ability to change the judgement card. Then, proceed to the right until you reach the next judgement tinkerer. This process continues until the character to the immediate left of the character taking their turn is reached. If Sima Yi is on the brink of death, he cannot take a hand card from the player who hurt him in hopes of getting a Peach or Wine to save himself. Powers are suspended when a character is on the brink of death, so Sima Yi cannot take a card until after he is revived.